On Tuesday afternoon, hundreds of people (though 3,100 RSVPed on Facebook) gathered to build a “great wall of love” in front of an LGBTQ-focused health clinic, where the Westboro Baptist Church was set to protest. In reality, the love wall was a beautiful symbol of solidarity, but massively outmatched the hate group’s protesters—there were only a handful, and they stood on one corner, surrounded by cops on bicycles, a few more protestors, and approximately one horde of media/citizen journalists/outreach reps/content creators/photograph takers. For all the beauty of the massive gesture of support and tolerance, it was bizarre to see all those people milling about, clearly waiting for trouble. 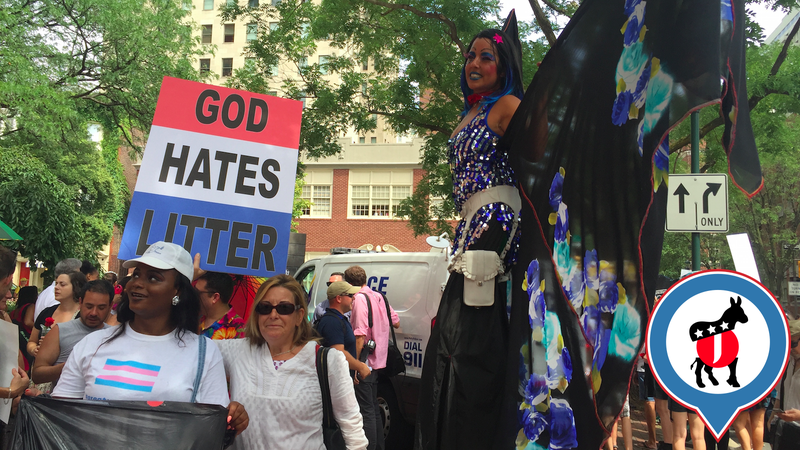 I stayed awhile too, but the WBC only continued to wave their trollish signs and sing, grateful for the outsized attention, and the wall of love kept singing louder. Click here to learn more about the Mazzoni Center and its work.